2060 Class A Stereo Amplifier audio amplifier from Boulder Amplifiers, Inc.
Hi-Fi Amplifier > 2060 Class A Stereo Amplifier > Boulder Amplifiers, Inc. The Boulder 2060 has an uncanny ability to keep any speaker load under full control while accurately rendering subtle detail, thus opening new possibilities for the creation of ultimate music reproduction systems. Innovative automatic load-sensing class A biasing provides ultra-low distortion at all listening levels. The fully balanced input circuit uses a pair of Boulder 993s to provide noise-free input buffering and most of the voltage gain. The output stage uses eighty output transistors and forty-eight power supply filter capacitors per chassis to assure stable, high current output into any load. Heat sinks are machined from solid aluminum, providing both optimum heat dissipation and higher instantaneous peak power without distortion. 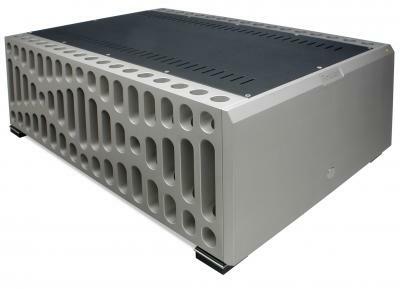 2060 Class A Stereo Amplifier > Boulder Amplifiers, Inc.